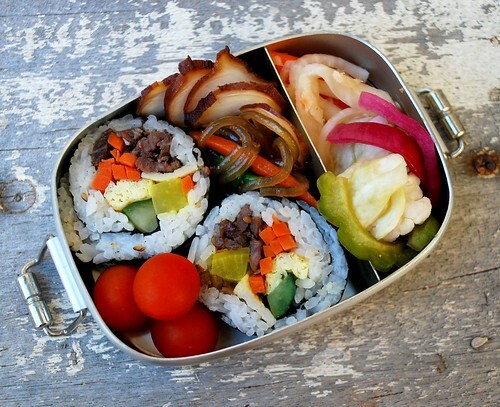 Kimbap Bento, originally uploaded by sherimiya ♥. We are spending the holidays in Hawaii with family this year. I was born in Hawaii and lived here until I went to California for college. Lots of my family are still here, so there's plenty of reason to visit as often as we can. Here is my first bento in Hawaii, using local eats that were already hanging around the house: kimbap, long rice, smoked tako, Kahuku cherry tomatoes, pickled daikon-carrots-bittermelon-cabbage-cauliflower-red onion. Packed in my lovely Japanese field-worker's bento, happily the perfect size for a hot weather appetite. Cute bento box! I just went to the link to read about it. Great history! And of course, lovely bento. Oh I love kimbap! Looks delicious. Have fun in Hawaii and Merry X-mas, sheri! Yay for kimbap! Looks like an awesome "mixed plate" to me. I mentioned on flickr that a historical piece on field-worker bento would be culturally interesting. Sounds like you're enjoying your visit home. Have a safe happy holiday! Thank you Amaaris... kimbap is great -- so many fillings there's hardly any rice, hehe! Merry Christmas to you and your family too! Hi hapa bento! Yay for kimbap is right! Is it just me or are there a lot of Korean posts floating around right now?! Thanks for the note on the bento; you're right about that. We are having a great time. Warm and happy holidays to you and your family too!! Yummy kimbap bento from Hawaii ... this one will be very special. Thanks for the link, nice to read it. Have fun Sheri with your family! Merry Christmas to you and yours, and best wishes for a happy new year to all my bento friends!! Your bento are always so inspiring! I wonder if my husband would appreciate them, since we don't have kids yet. :) Also, is that japchae? Thanks! Hope 2010 is a good one for you too! See you soon in the bento pools! !